Chattanooga State Community College recently received approval from the TBR College System of Tennessee to offer a new Spanish course, HUM-1110 Latino Cultures in the U.S., as a general education course beginning with the fall 2019 semester. The class will qualify to fulfill the humanities and/or fine arts requirement that all colleges in the state of Tennessee demand. Assistant Professor of Spanish, Juan Antonio Alonso, was the driving force behind the creation of this new course. 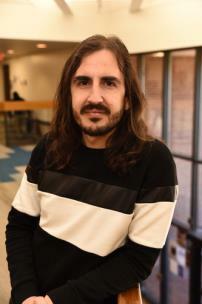 After years of advising foreign language majors, Alonso said students would ask about a humanities class that would go well with their degree. Discovering that there was nothing offered about Latino culture, he designed a new special topics course at Chattanooga State and was surprised to have 35 students enroll in it over a two-semester period, which convinced Alonso and the academics division that there was strong student demand for a class of this sort. Many of the more than 50 million Latinos in the U.S. today speak English. This implies that, even though learning Spanish continues to be an important tool to approach this community, learning about their history, culture, communication style is as important, if not more. “Taking this class is an opportunity to have a more holistic, complete vision of the history, and the current cultural and social reality of the United States,” shares Alonso. Students who enroll in HUM-1110 will benefit by fulfilling a transfer and/or graduation requirement. “Latino students will get an opportunity to learn more about the history and context of their presence in this country, helping them integrate their personal experience into that of their community. Non-Latino students will get an opportunity to take a first step towards becoming experts in one of the key elements in the fabric that makes our country what it is today,” explains Alonso. HUM-1110 will be divided into four blocks: Latino history in the United States, Latino diversity, intercultural communication, and Latino art and literature in the U.S. Several experts in their respective fields will collaborate with the class, so students will have access to a different array of highly qualified instructors. Class materials are available for free, so students don't have to worry about that extra expense. During previous special topic offerings, classes took trips and collaborated in small projects with local entities. For more information about HUM-1110 Latino Cultures in the U.S., which will meet at 12:30 p.m. on Tuesdays and Thursdays this fall, contact Juan Antonio Alonso at (423) 697-2505 or email juan.alonso@chattanoogastate.edu.